There are many different work boots on the market with a large selection of options to choose from. There are some things that you will need to consider when you are searching for the right pair of work boots for your needs. How many hours a day you will be wearing them is one important factor to think about. With all of the benefits a quality pair of work boots provide, it is worth it to take the time to know which pair of work boots will be the best for the job and for your health. Many jobs require work boots due to the nature of the job. These jobs can include construction work, landscaping, automotive work and factory work. A good quality work boot provides protection and support and can mean the difference between being safe and comfortable and being miserable. This factor alone will determine the impact the boots will have on your back, ankles and knees. Investing the time to learn about the different boots and options available will make a difference in how you feel throughout the workday and afterwards as well. Timberland is a well known name in work boots. They are known for producing high quality boots that will provide the safety, protection, fit and comfort that you are looking for. 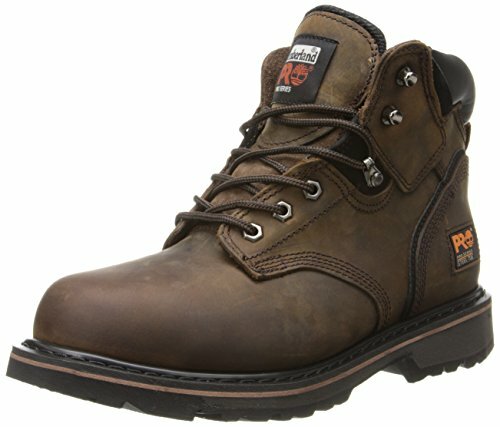 These PRO Men’s Steel-Toe Boots have a synthetic outsole that is abrasion, slip and oil resistant. The steel toe construction has a roomy toe box, more so than other brands, and meets ANSI safety standards as well. The roomier toe box means no pain in the feet even after you have been on your feet for awhile. The leather boot features laces and tonal stitching. The collar is padded for additional comfort and there is a logo on the tongue. The foot bed is constructed from open cell polyurethane that features an Agion odor control cover. The midsole is also constructed from polyurethane that absorbs shock and gets moisture away from the feet so you are not standing with damp feet. These Timberland work boots have exceptional traction grip that is perfect for working on slippery or wet surfaces. There is electronic hazard protection that helps keep wearers safe from circuits that are open. The removable sock liner prevents blisters. These tough, quality work boots will make a big difference in how your feet, back and legs feel during work and once you get home at the end of the day as well. 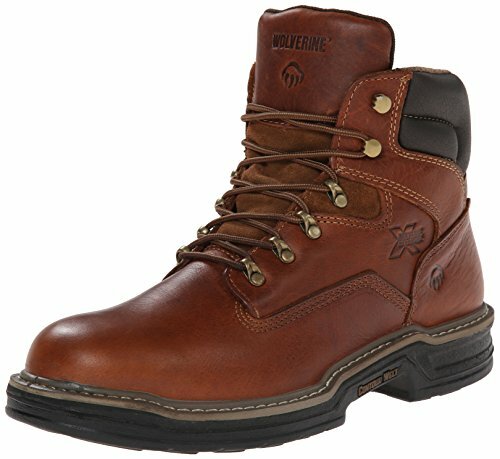 Wolverine Raider work boots provide you with all the comfort and protection you could want in a boot. They have plenty of extra cushion and flexibility for maximum wearabillity. They have full grain leather uppers plus a full-cushion foot bed that provides extra cushioning in the heel and foot areas. This extra cushioning absorbs shock and pressure. The outsole is made of durable rubber that provides plenty of resistance against slippery surfaces. This rubber outsole also resists oil, chemicals, heat, slips and more. The wave mesh lining inside promotes breathability. The collar of the boots is cushioned for maximum comfort. The tongue and the sides of the boot feature debossed, Wolverine logos on the sides of the boots and on the tongue as well. The midsole is made from polyurethane that is very flexible and lightweight as well so no extra weight is added to the boots. These terrific work boots are available in medium or extra wide in plenty of sizes. Caterpillar is another well known and respected name in work boots. These Second Shift Steel Toe work boots have plenty of features that make them an excellent choice for your work boot needs. The genuine leather foot has a 6” matching, lace-up leather shaft. The collar is padded for added support and superior comfort. The toe is rounded and features a protective steel toe. 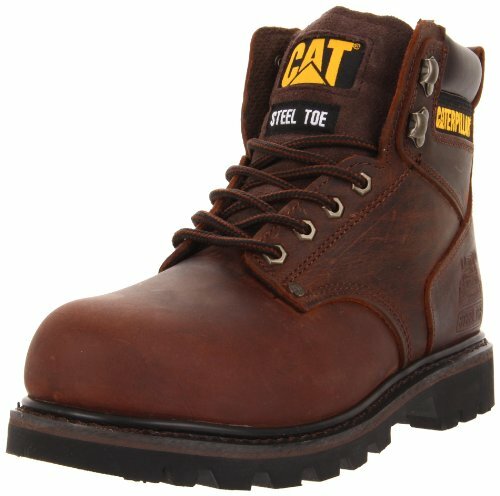 The tongue of the work boots features the CAT logo. The outsoles are made of durable rubber and are slip resistant as well. The long lasting, rugged quality of these boots will last and make work much easier to deal with since your feet will not be hurting. The grommet of these boots, are hexagon-shaped and provide fast lacing at the shaft too. These are the perfect work boots for construction workers and factory workers. They are high quality and will last a long time while providing the wearer with plenty of protection and comfort. Finding the right work boots is very important when you work in certain jobs including construction, road workers, automotive, factory and other types of work where having high quality, heavy duty protection is a must. Finding the right work boots for your specific needs doesn’t have to be complicated. Knowing what to look for and what needs you have are two of the most important pieces of information that you can have ready. This makes researching and choosing your work boots much easier. The three top rated work boot selections we have reviewed above are all popular brands that many consumers love. This is due to the high quality they possess and the features they offer. All three choices have plenty of options including leather uppers, solid rubber soles and protective steel-toe construction that provide the wearer comfort and protection they can count on. If none of the top rated choices above are what you are looking for, read our buyer’s guide below to learn more about how to identify the best work boots for your needs. This information will educate you on the different factors you should consider as well as teach you what makes one pair of work boots better than another. There are several things that you can look at when sorting through the different types of work boots available. We have listed these factors below. Height – Work boots come in many different heights ranging from 5” to 12”. The most common height for most work boots is between 6” and 8”. They usually have a lace up system of some kind. You can look at the different heights in relation to the job that you are doing. For example, a 5” boot allows for maximum flexibility at the ankle. If you’re looking for ankle protection and support, don’t get a boot that is less than 8” which will come up above the ankle. The high 10-12” work boots provide plenty of protection for the lower leg and has some flexibility at the ankle. Lacing Systems – There are a number of lacing systems available that are designed to keep the boots snug and fitting properly. The most common types of work boots include the traditional style of eyelets, D-ring eyelets for fast lacing; metal hooks for even faster lacing or it can be a combination of these different styles. The type of lacing system is largely up to personal preference although if you need a tight fitting, snug boot you will want to choose a lacing system that you can keep snug. If you spend a lot of time standing on hard surfaces such as streets, concrete floors, and sidewalks, comfort is great importance when it comes to a quality pair of work boots. One feature that is a big help when you are standing a lot is compression pads. These are built into the sole of the boot and are made from materials that compress when weight is applied by the wearer. These compression pads help absorb shock and reduce fatigue as well. The way the boots are made is another factor you want to look at. In fact, it will play a large part in the quality of boot and affect its performance, longevity and comfort as well. The most durable technique used in work boots is welt construction. The welt is a piece of leather or man-made material that is located between the sole and the upper. Both parts of the boot (upper and sole) are attached to the welt. Some welt construction uses double stitching to provide even more durability. This double stitching will stitch the innersole, the upper and the outsole together through that leather welt. These are the most rugged and long lasting boots you can find. Boots with this type of construction are perfect for jobs where you are working in extreme conditions and work environments. Another method of construction is the direct attach method. This method uses a mold that is attached to the top part of the boot that has been injected with hot, molten rubber that forms the sole of the work boot. The benefit to direct attach work boots is that they have superior shock absorption, are very lightweight and comfortable and are durable. These work boots offer the wearer the ultimate in stability, fast movement and exceptional traction. The third most popular form of construction is cementing. During this process a high strength, flexible and durable adhesive bonds the outsole to the rest of the boot. Boots that are made with this method of construction are not as expensive as work boots with other types of construction. These boots are good for light duty work but do not have the long-lasting quality needed for heavier duty jobs. If you want the strongest work boot, look for those that have used the double-stitch welt construction. There are many safety features that work boot manufacturers may offer consumers. These include steel toes, protection from shock, prevention of static discharges, acid-resistant soles, and superior slip resistance. All of these safety factors play a part in providing consumers with work boots that are not only comfortable but that will protect the wearer from a variety of potential hazards as well. Consider your job tasks when you are looking through the different types of work boots. If you work in areas where things can be dropped, steel toes are a must. If you work in the electrical industry, you want to ensure that you choose work boots that can protect you getting shocked. Choose the work boots according to the jobs you have to do and the risks that you will be faced with. Check with your company to make sure that the boots you choose meet the job requirements that OSHA requires. Work boots are a necessity with many different types of jobs. It is important that you choose the right work boot to fit the needs that your job requires. There are many different types of work boots on the market so finding a pair that will provide all you need is possible if you take the time to determine your specific needs and preferences. There are many features that you can choose from when looking for the perfect work boots for your needs. These features will range from upper height to sole construction to safety features. You want to find the work boots that have all the features you need so you will not have to worry about your shoes causing trouble or not protecting you from slipping, dropped items and other similar job related incidents. The three top rated work boots that we have featured above are great examples of the kind of high quality, feature rich work boots you want to purchase. They are all from reputable companies that take pride in providing safe, rugged, and stylish work boots for any number of applications. Once you determine what your specific needs are, you will be able to see if one of the top rated choices we have featured above will be just what you’re looking for. If not, you now have the information you need to sort through other types of work boots and make an informed decision on the ones that will provide everything you need.